One of my favorite things about the approaching holidays is discovering new ways to make a gift that one of my loved ones might enjoy. 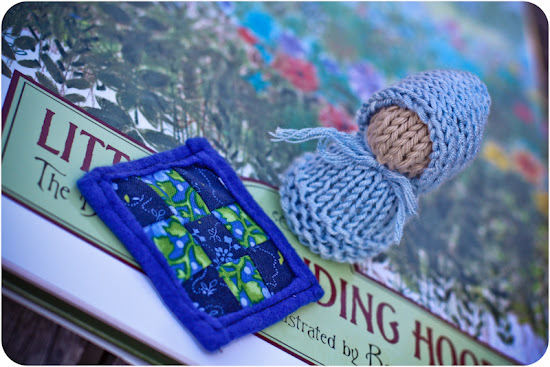 From knitting to bath salts, I've handmade many gifts through the years and keeping the gifts fresh and tailored to each individual is a goal I strive for each year. We also give gifts that are handmade from others and even some gifts from stores, but I truly relish seeing my family take pleasure in something I've made with my own hands. And so, when I was finished with my Martinmas crafting a few weeks ago, I couldn't help but think that the little lantern child might make a great Little Red Riding Hood. I shortened the cape to make it more "hood-like", and of course, made it red. All of the yarn I used came from the scrap basket. 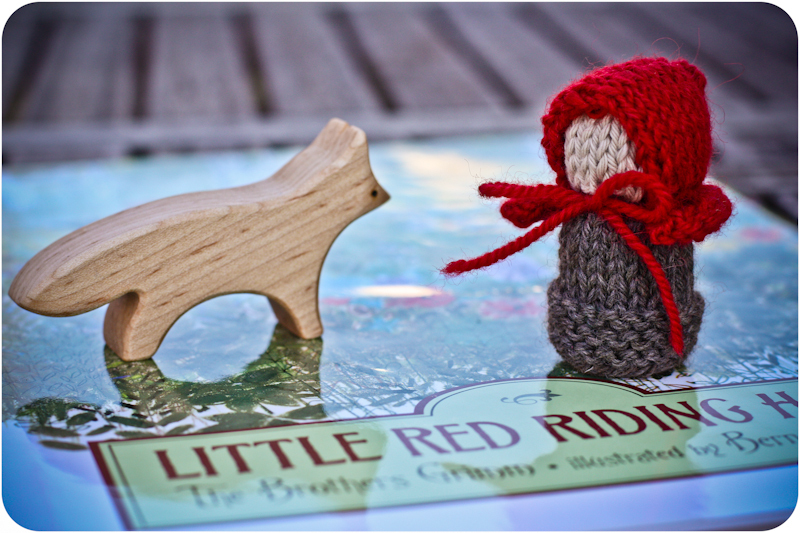 I stuffed Little Red with a wooden peg doll from our basket so I didn't need to buy anything to make Little Red at all. The wolf was a bit trickier. 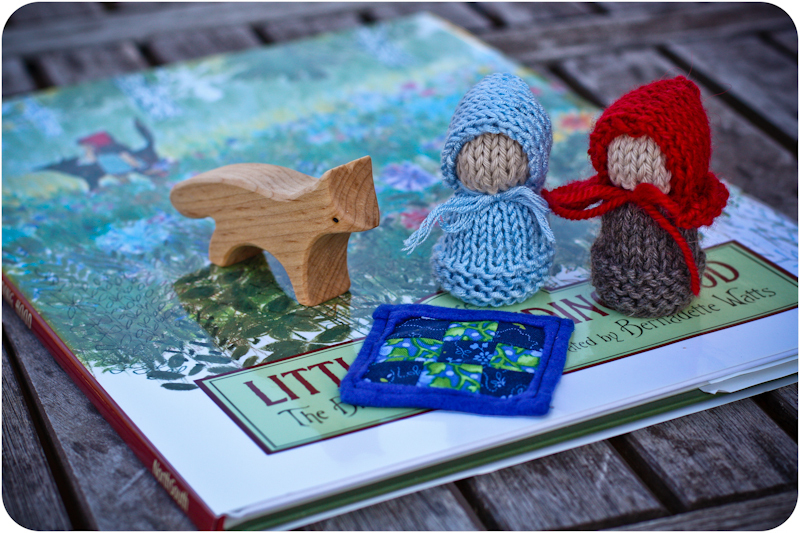 We love our other little wooden animals from Jupiter's Child, and they are very reasonably priced. I decided to use the fox from them as our wolf. The size is pretty close to a wolf size when compared to the dolls. The book I used to accompany this Little Red Riding Hood playset is the version illustrated by Bernadette Watts. Her illustrations are my favorites for fairy tales. I purchased one new copy from Amazon and another used copy from our local used bookstore. I ended up making 2 sets of this little playset, one for Finn and one for a friend's children. Since everything besides the books and the little wolves came from items on hand, it was a very reasonably price handmade gift. 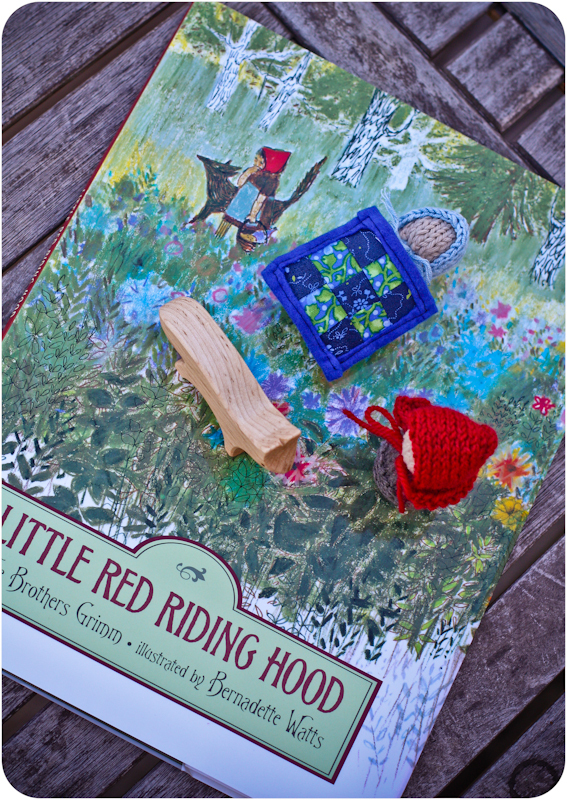 If all of the children receiving this gift enjoy playing with it as much as I enjoyed making it, Little Red Riding Hood will be a well-loved toy indeed. What fun!! How lucky the recipients of those sweet gifts will be!! This is just gorgeous!!!! Absolutely love it! Too cute, Joy! And, as always, very creative! I'm actually doing something similar as a Christmas gift form my almost three year old. 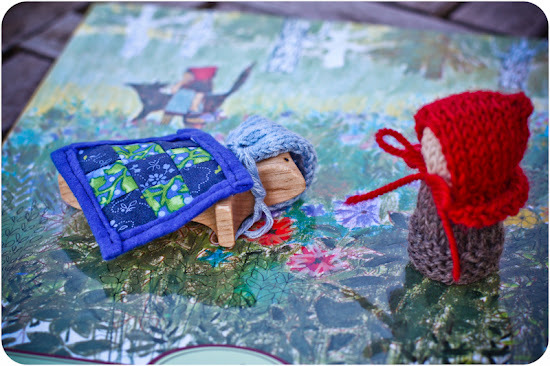 I am almost finished hand knitting a little Red Riding hood cape for her and it will be wrapped with a collection of fairy tales. She doesn't yet own a collection of fairy tales and I treasured my own so much as a child that I want her to have one as well. Oh my goodness, Joy! What lovely gifts!! That is so stinkin' cute. Promise you will help me with knitting next time i am in town. And your knitted toys are cute!